“A new city where past and present coexist, transcending reality and imagination,” Paradise City had its successful grand opening in April. 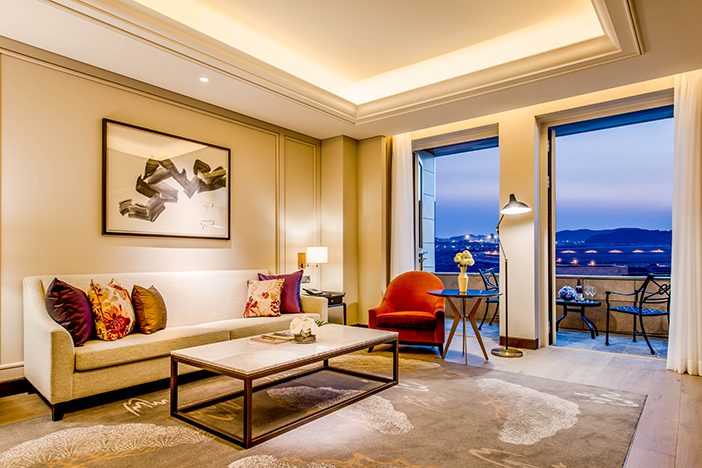 Since then, Paradise City has been gaining popularity among Koreans as a domestic vacation resort within Seoul’s vicinity, and has become a must-go attraction for international tourists. 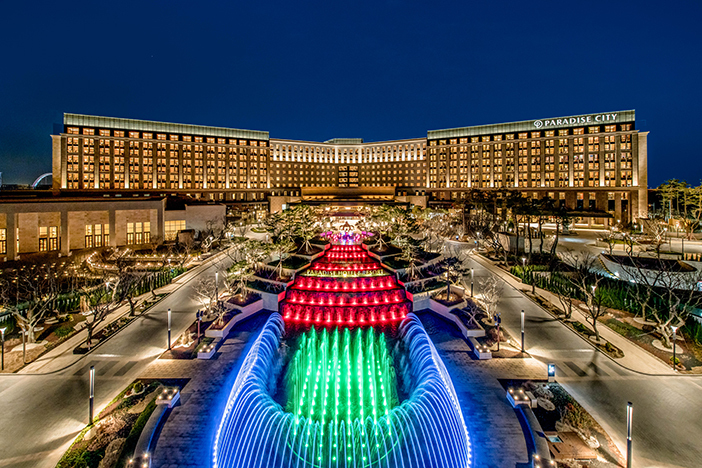 Paradise City is the first multi-complex resort in Northeast Asia that offers accommodations along with recreational activities, including a casino and spa facilities. In other words, Paradise City has everything you need for a fun-filled, relaxing vacation! One of the cultural perks offered by the luxurious Paradise City is “art-tainment,” a portmanteau of art and entertainment. 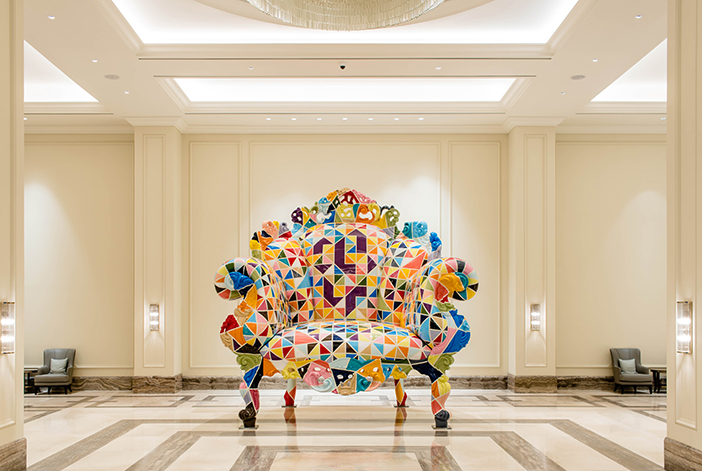 A total of 2,700 excellent artworks are scattered throughout the resort in areas like the first floor lobby, in front of the elevators, the lounge and the casino. Visitors will find pleasure in art structures by artists who are well-known domestically and worldwide, such as Alessandro Mendini, Demien Hirst, Kusama Yayoi, Lee Kang-so and Oh Soo-hwan to name a few. Paradise Hotel & Resort is located from 5F to 10F with a total of 711 guest rooms, including 373 Deluxe rooms, 1 Deluxe Pool Villa, 1 Grand Deluxe Pool Villa and other suite rooms that guarantee a relaxing night. This five-star hotel promises everything you need from comfort to sensual pleasure for an extravagant vacation. With seven different restaurants to serve your appetite ranging from Italian and Japanese cuisines to a casual poolside snack bar, your palate is in for a treat at Paradise City! The resort’s all-day dining restaurant On The Plate is a premium buffet restaurant with open-kitchen cooking stations. It boasts a collection of 400 different varieties of wine, and unlike other buffet restaurants, On The Plate has an independent bakery and a coffee zone within the venue. 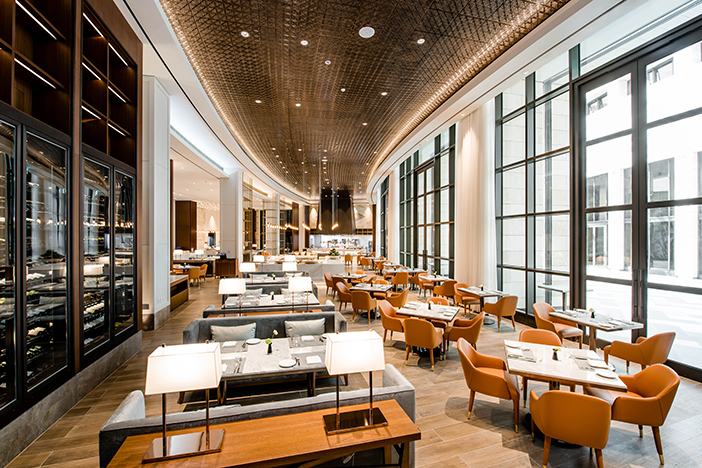 Other popular restaurants among visitors include the trendy Japanese fine casual dining restaurant Raku and Italian gourmet restaurant La SCALA, famous for its signature brick oven pizza. Paradise City’s health and fitness zone will surprise you with its spacious and easy-access sauna facility that offers Jacuzzis, dry and wet sauna rooms, along with a fitness room packed with up-to-date health equipment. 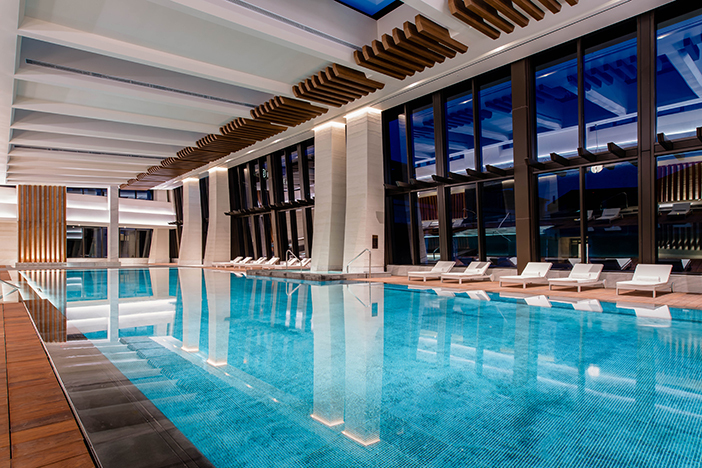 You can also enjoy the scenery of Yeongjongdo Island all year round at the indoor pool through the panoramic floor-to-ceiling windows while you relax and have fun in the water. Paradise City is also a popular destination for family vacations due to its family-friendly entertainment facilities such as the Kids Zone, 10 Pins, PlayStation Zone and more. Kids Zone is an earth-themed experience center where children can participate in diverse learning activities using their senses with the assistance of trained staff members. 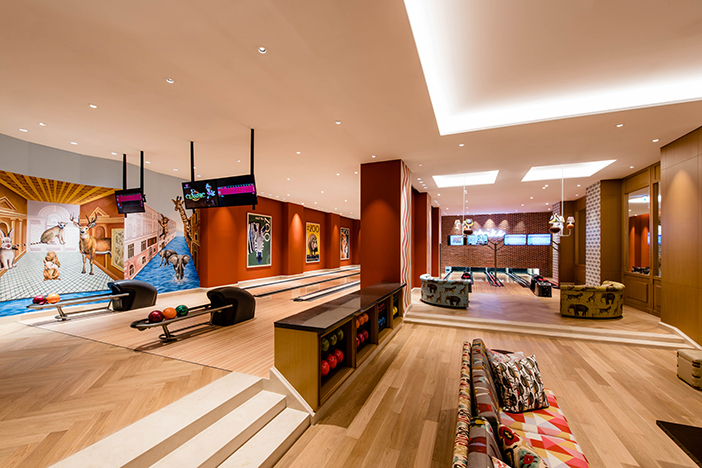 Another family-friendly game facility is 10 Pins, a bowling alley with regular bowling lanes and a special set of bowling lanes just for kids. In particular, 10 Pins features the world’s first pool table made of glass for a billiard experience you don’t want to miss. PlayStation Zone, prepared exclusively for kidults, has enough gaming tools to excite any game lover, including VR games and the latest Sony game consoles. 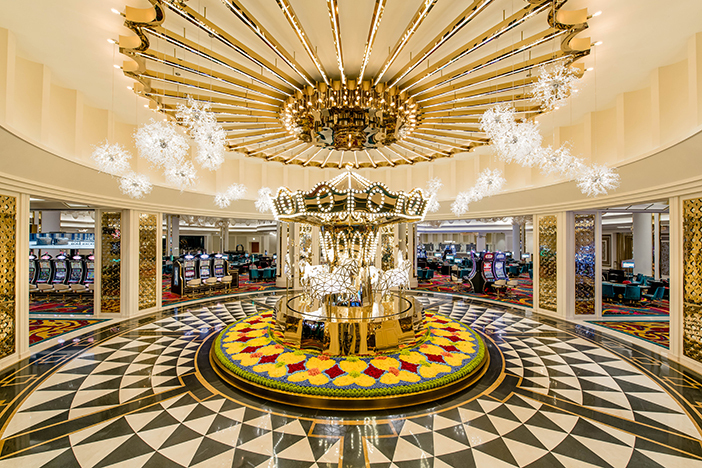 Equipped with a high-tech gaming system and exceptional customer service, Paradise Casino is the largest casino in Korea, boasting a total of 449 game machines. Aside from the regular gaming room, the casino also has a special entertainment area for holding diverse events and an exclusive VIP facility. * This column was last updated in June 2017, and therefore information may differ from what is presented here. We advise you to check details from the official website before visiting.